In fact, many of the people at that office followed the rules. They were quite happy and content to follow the rules. I just could not do it. In fact, in one instance I was admonished not to dispose of an overflowing trash can because “there were contracts in place.” The absurdity of the rules made my workstation a pig sty. I’ve never really thought the rules applied to me (yeah, I’m that guy). I didn’t really understand the rules or the process. I didn’t understand that there were forms and processes required to step outside my lane. I foolishly thought the rules didn’t apply to me; consequently, I was punished with bigger assignments and broader opportunities. Someone eventually remarked to me, “competence is severely punished around here.” Indeed. I think there’s one rule—you have permission: permission to follow the rules sometimes and break the rules other times, permission to challenge the status quo, and permission to fail. Of course, this permission is not free from consequence. Maybe taking risk leads to getting fired, bankruptcy, termination, falling off your surfboard, or God forbid getting promoted. It’s okay to break the rules as long as you know you are the rule you are breaking. You have permission to rebel, to push against the status quo, speak your mind, ask for forgiveness, take risks, swim against the current, to eat drink and be merry, to zig and zag, to be different, and maybe, just maybe, change the world. History remembers the bold. 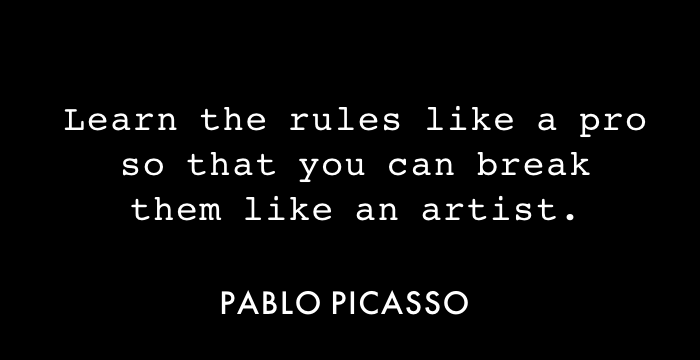 Not everyone can or should break the rules, but just know that you can. So how did the story play out? Well, neither of us are still at that company. Joe retired and is enjoying a predictable life with predictable income. I took a different path. Breaking the rules allowed me to explore really cool opportunities within the organization, which led to working for the home office and being in a number of meetings that were “above my pay grade.” While many of my former colleagues are still happily and stably employed, I continue to break the mold and try new things.